This entry was posted in Burda, Sewing, Tops, Wadders. Bookmark the permalink. Oh you are a HOOT! You know I had a pretty bad spell of “wadders” over the summer months. Completely threw off my sewing mojo. Can’t say that I’m completely in the clear either. Though I did finish one project successfully last month. Funny, I always find the quick and easy projects to be rather difficult for me. They always end up wrong. Always! Oh I know all about the issues with Burda’s economy drive on pattern printing! I have twice mistraced a piece where the line crossed from another pattern with the same colour. It is a pain! As for the notches, now I look at the pattern layout in the magazine, find where all the notches are located and use a felt tip pen to mark them on the pattern before tracing so I can’t miss them. It is too too easy, especially with the red lines, to miss them altogether and that’s a pain when it comes to matching things later! We can all relate to your frustrations of making a pattern when you love it on someone else, and know in your heart you can’t pull it off. But hey, I am a firm believer in taking risks, and you never really know until you try. 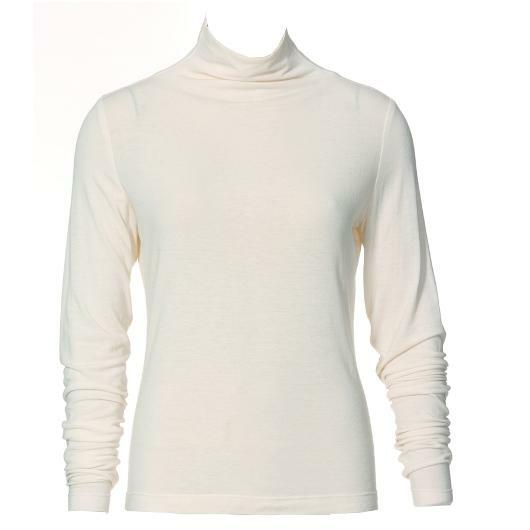 The whole point is for the neck to wrinkle artistically, matching the very-long sleeves which must wrinkle too. 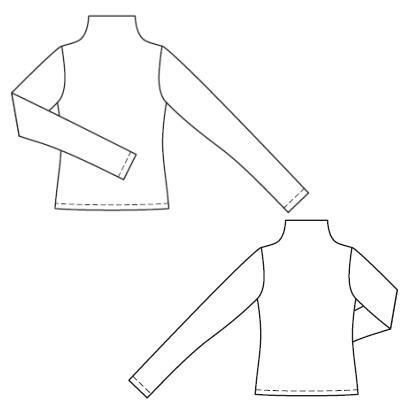 If you wanted a turtleneck with sleeves the ‘right’ length and a smooth neck, you should just mail-order one (but it sounds like you don’t anyway :-)). Bummer! I had pretty good luck with this one. On the other hand, I can never fit or look good in a sheath dress and you make so many gorgeous ones that really suit you (recent wadder excluded, of course!) For me, I have to turn to craft sewing now because of Xmas looming. By January, I’ll be ready to throw myself back into dressmaking. Thank you. It is soooo nice to know I’m not alone in my sewing mishaps. Love your humorous take on it all. Oh no!! There are so many good versions of this shirt that I thought about making it, too. Thanks for reminding me that just because it looks good on others it doesn’t mean I have to make it, especially when I don’t even like turtlenecks! 🙂 Hope you next project comes out spectacular! Sorry to hear about the turtleneck wadder, it is disappointing to put that effort in and it doesn’t work out. I’m sure your sister will enjoy using it. I can relate to your post as I hate turtlenecks and also have decided not to renew my bwof subscription after realizing I sew exactly none of the patterns! For every TNT I find I have to slog thru 3 or 4 total disasters, it seems. This is why I don’t sew knits anymore: They become wadders so much easier than wovens do. Don’t ask me why, they just do. Mmmm – sorry yours didn’t work out for you. It’s so frustrating when things don’t turn out how you envisaged them to be – but at least you can see the funny side of it. I have to agree with Lindsay that knits can be problematic – they seem to have a mind of their own. Good luck with the next project! Very clever funny post! I’m sorry your easy knit shirt turned into such a bear. Hopefully Burda will keep up with the comments I am hearing on the blogs and amend their ways. Sorry about this wadder (I know about wadders) – but at least your sister will have a new top. It seems quite a few people are not happy with BWOF lately because of the same issue you mentioned. So sorry this didn’t work for you. You will find that over time as you learn more about what you like and don’t like that you actually become more refined and selective – that is a good thing. Also – there really isn’t a “wrong” side of the fabric. You are free to use whichever side you like – the only problem is when you mix the sides. I always do a (big) chalk mark on what I want to be the “wrong” side as I am guilty of messing that up from time to time. We learn from every garment we make – wadder or not. Here’s to no more wadders in 2010!